Karl Harris, CEO As the news of a hurricane hitting the Gulf Coast of Louisiana streams incessantly on the evening news, the in-house counsel at an insurance company knows she must swing into action. In no time, insurance claims will start pouring in and while the counsel has ample information on claims payout, her data around claims denial is still sketchy. Any other counsel in her place would have taken the beaten path and done the obvious to prepare for cases: engaged heavily in legal research, based inferences on anecdotal data shared among practitioners, or pinned complete trust on the judgment of a seasoned lawyer. Not on this occasion. Our insurance counsel has a one-of-a-kind legal platform that surfaces in-depth insights on all the federal hurricane-related cases ever filed in Louisiana. From millions of cases, she can narrow down the search to a few hundred that are most relevant. She can also drill down to the number of terminated insurance cases, the duration, cost and the findings made by the court or jury in most cases, the litigator who often defends such cases, and much more. The counsel now understands a probable litigation outcome better and has a solid strategy in place, improving her chances of a favorable outcome for her insurance company. The revolutionary solution is none other than Lex Machina's Legal Analytics, the go-to platform for successful insurance litigators today. While most conventional legal research methods stop at data extraction, Lex Machina brings the power of accurate, insightful information to a litigations space that was long yearning for analytics. 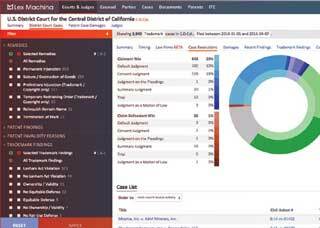 A division of the renowned legal content provider LexisNexis, Lex Machina provides data-driven litigation insights on courts, judges, lawyers, law firms, and parties, mined from millions of pages of unstructured docket entries and documents, enabling lawyers to predict the outcomes that different legal strategies will produce. The platform leverages NLP, machine learning, and the latest advances in data science to clean, tag, and structure information to empower law firms and enterprises with unprecedented strategic insights in minutes. “Lex Machina is heading a paradigm shift in legal technology by redefining how law firms and corporate legal departments win in the practice of law. Our goal is to bring openness and transparency to the law, like we’ve never seen before, through data-driven decision-making,” states Karl Harris, CEO, of Lex Machina. The story behind Lex Machina’s genesis goes back to 2006 when it was born as a public interest project from Stanford Law School. It was initially called the Stanford Intellectual Property Litigation Clearing house and focused on IP. In 2010, the project was spun out into a legal-tech company and renamed Lex Machina. Soon the company went on to attract millions of dollars in Venture Capitalist funding, was successfully acquired by LexisNexis in 2015, and the rest, as they say, is history. Today, Lex Machina’s Legal Analytics is applicable to various litigation scenarios, starting from insurance, employment, contracts, product liability, and more. “When we were exclusively in the patent space, we continuously received inbound interest from large insurance companies that wanted to sell patent litigation insurance and use our data to properly assess the risk and the cost of litigation. At Lex Machina, we are trying to prove a simple thesis: Legal Analytics can help you win in all areas of law,” says Harris. When it comes to insurance litigation, what makes the Legal Analytics platform unique is that it includes over 98,000 cases (including class actions) involving disputes between an insurer and a policyholder, a beneficiary, or another insurer that is asserting the rights of a policyholder. It covers a broad spectrum of policy types including home, life, auto, commercial and professional liability, health, and disability income. These cases are all taken from Public Access to Court Electronic Records (PACER), a database of many millions of court documents filed electronically in every District Court case. Legal experts at Lex Machina further refine the high-value data, and natural language processing algorithms mine and normalize basic data into higher-level concepts. Armed with this information, insurance lawyers are better equipped to predict the duration and cost of a legal proceeding, the expected damages, the strategies that could be employed by their opponents, the right moves for winning a case, and other such important considerations. Adding to the advantages is the fact that Legal Analytics is easy to use and has a user interface with graphical representations that are customizable. Corporate counsel use Lex Machina to select and manage the best outside counsel, protect company assets, compare their performance with peer companies, and achieve favorable businesses outcomes. To better understand the superior value proposition of Legal Analytics, Harris describes a scenario. An organization is in a complete dilemma: they want to sue their long term business partner for breach of contract and they have a commercial general liability policy that is supposed to provide insurance cover for such litigation costs, but the insurance company is just refusing to pay up. The client reaches out to their outside counsel in the Southern District of New York (S.D.N.Y.) and in no time, the law firm has all required information on each time there has been a duty to defend in S.D.N.Y. Apart from that, with Lex Machina, they also have insights into which judge has the most experience in such cases, who represented the opposing parties, how long the parties litigated, as well as an accurate prediction of when a claimant might obtain recovery. As another example, Validity Finance, a provider of litigation funding, is a real-life exhibit of Lex Machina's unmatched prowess for data-driven decision-making. As a leading litigation funder, Validity finances about a dozen cases per year, with an average investment of $4 to $6 million. The goal is to ensure the client recovers at least 50 percent of any damages award or settlement, which is higher than what the typical funder offers. Once a case is under serious consideration for funding, the evaluation process is rigorous. It calls for detailed insights such as how many similar cases have been brought in a particular jurisdiction, how those cases turned out, and how long they took to be resolved, what are the track records of the lawyers involved on both sides of the dispute, how the opposing party has behaved in the past and so on. Lex Machina provides answers to all these questions. The platform's rapid, granular analysis by venue and judge proves matchless. Moreover, the accuracy and fast turnaround of information helps Validity stay ahead of their competition. "Our goal is to bring openness and transparency to the law, through data-driven decision-making, like never seen before"
Harris explains, “What we are doing is making the impossible, possible. We are the answer to a litigation space that is screaming for analytics. What the best lawyers could do until now is use anecdata, which is basically taking a few data points and then drawing conclusions from it. Our insights, on the other hand, save you days and weeks of work, and as a result, more than two-thirds of the Am Law 100, and insurance powerhouses such as Morgan Lewis , Baker Hostetler, Hinshaw & Culbertson, as well as many global carriers, including Allstate and Aon trust us." "Lex Machina is heading a paradigm shift in legal technology by redefining how law firms and corporate legal departments win in the practice of law"
In the days to come, Lex Machina will continue to bring their Legal Analytics to other areas of the law. Currently, they are focused on litigation in federal district courts and soon they will be expanding the breadth of their coverage to state courts. “We will be rolling out new practice areas such as consumer protection, tax, and environmental law, which are of interest to insurance companies. Overall, the target is to deliver deeper and more powerful analytics and allow users to search more individual cases,” ends Harris.